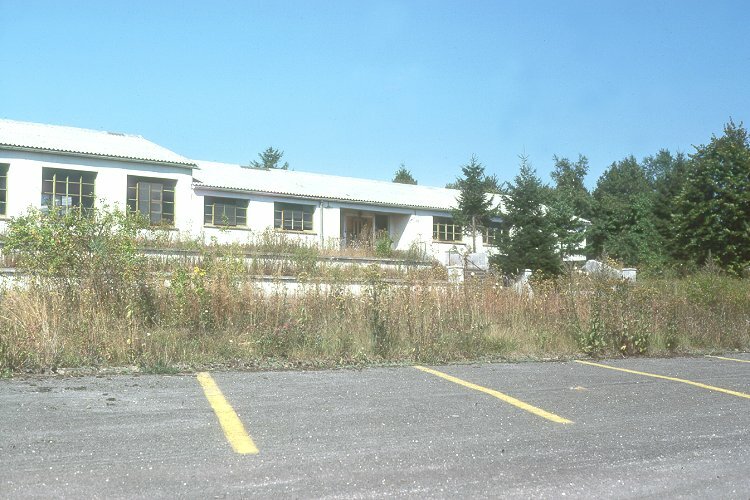 Exterior view from the entrance to the NCO's Mess - September 1975. Assorted photos taken during a Hard Times dance - March 1965. 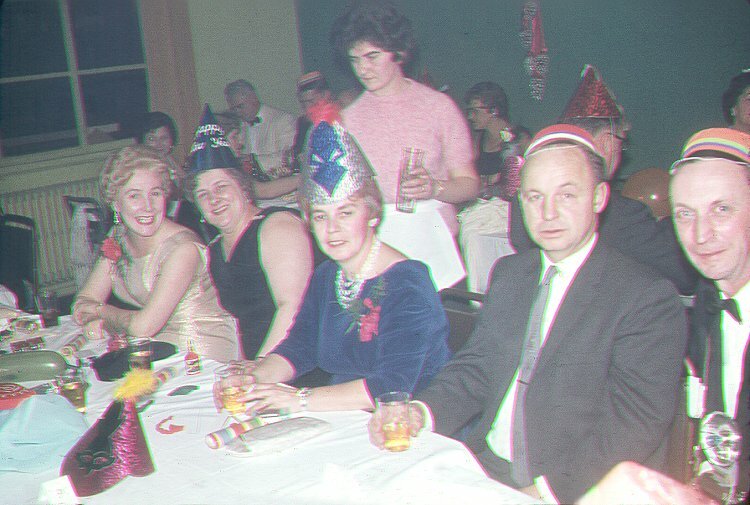 New Year's Eve dance - 31 December 1964. (L-R) Grace Rogers, Betty Shepherd, Mrs & Mr Hall, Ed Shepherd. (L-R) Andy & Lil Anderson. Assorted photos taken during a Sgts Mess Variety Show - November 1964. Senior NCOs Mess hockey team - March 1962. Large image of the Senior NCOs Mess hockey team photo - March 1962. 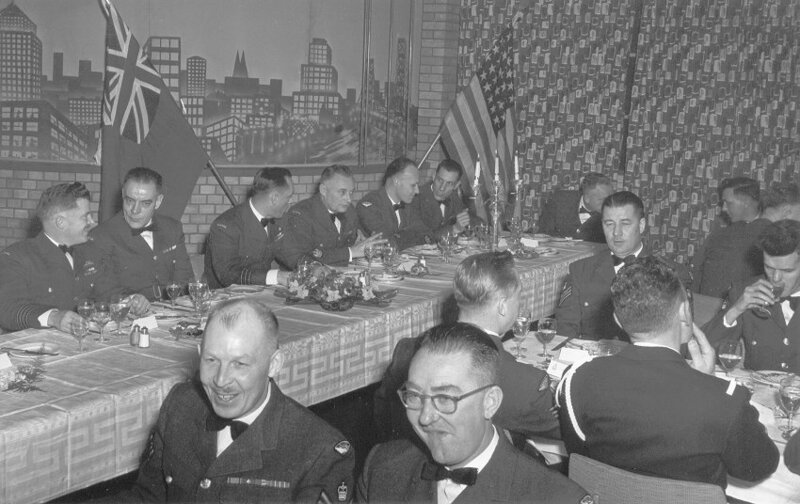 Mess Dinner - October 1961. G/C Blackie Williams patiently waiting for his meal. 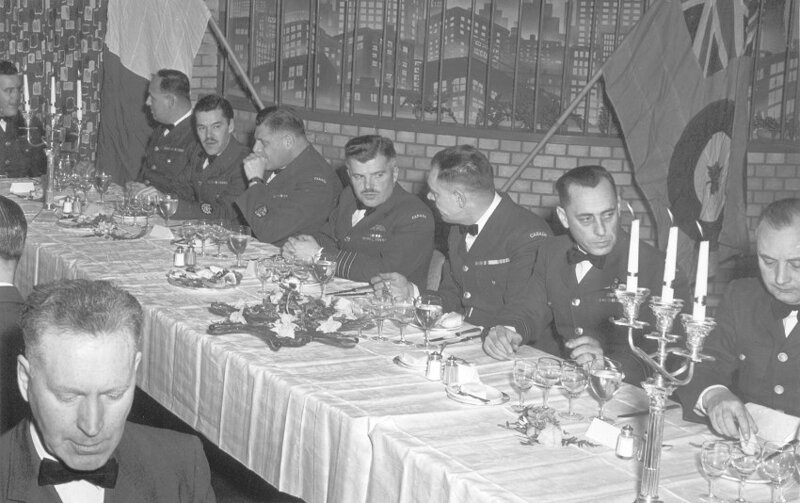 G/C Williams (far left) at head table during a Mess Dinner - October 1961. 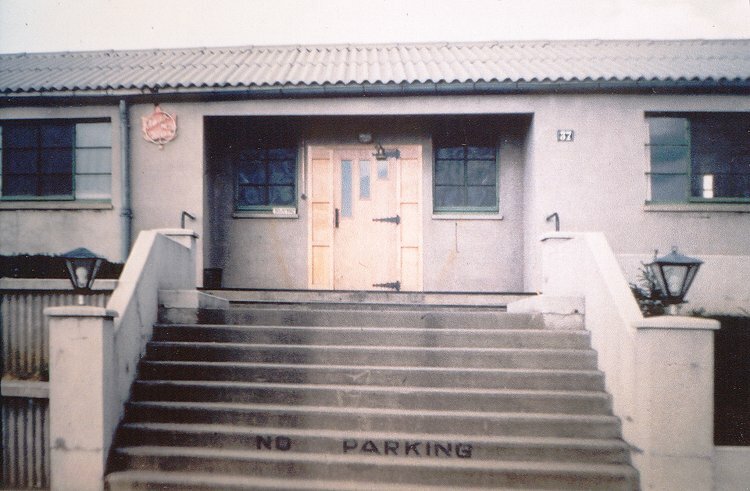 Entrance to the Sgts Mess - April 1961. Senior NCOs Mess hockey team - March 1961. 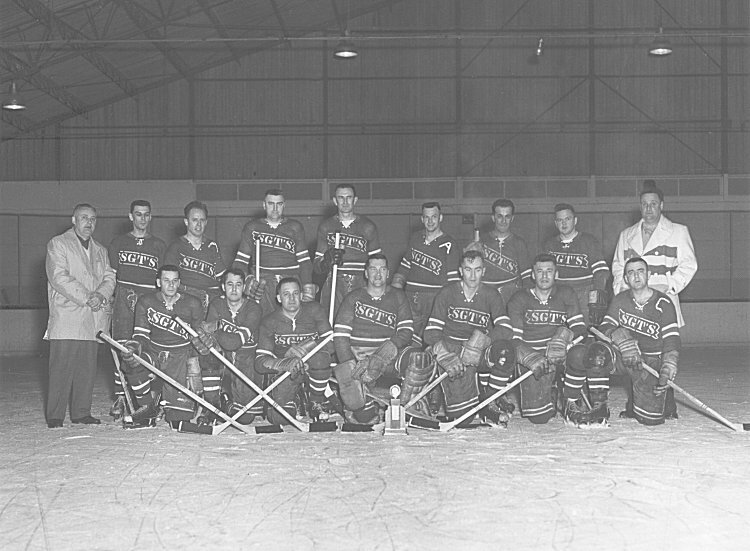 Large image of the Senior NCOs Mess hockey team photo - March 1961. 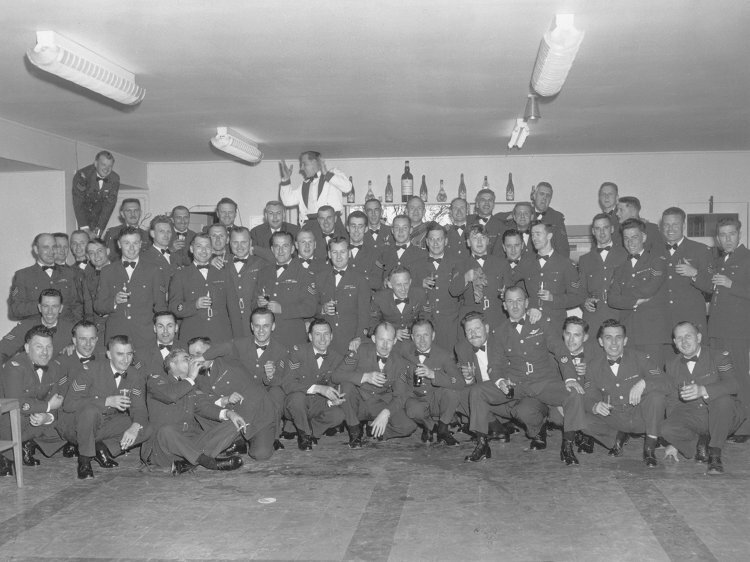 Members of the Senior NCOs Mess - April 1960. Larger image of the previous photo - April 1960. 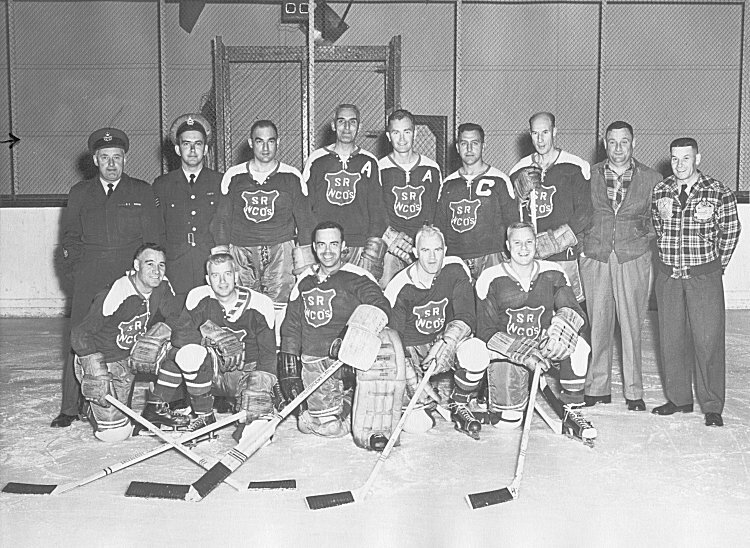 Senior NCOs Mess hockey team - March 1960. Note the trophy (front and center). 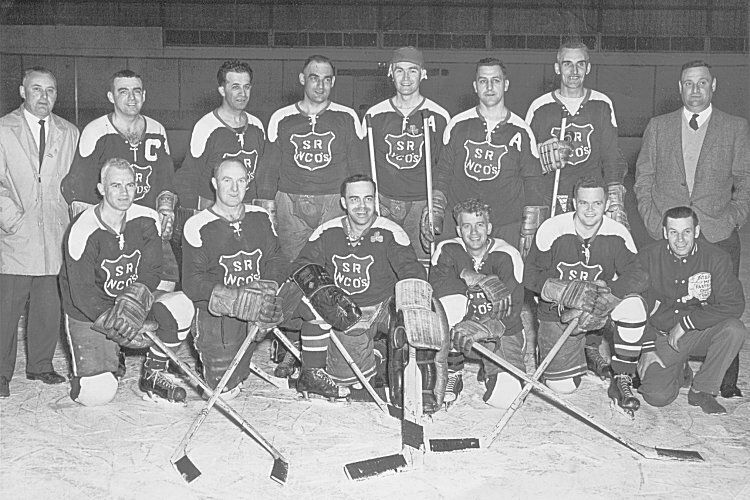 Larger image of the Senior NCOs Mess hockey team photo - March 1960. Back row (L-R) Beau Staples, unknown, unknown, unknown, unknown, unknown, unknown, unknown. Front row (L-R) Unknown, unknown, unknown, unknown, unknown, unknown, unknown. There were a number of signatures on the back of this photo. 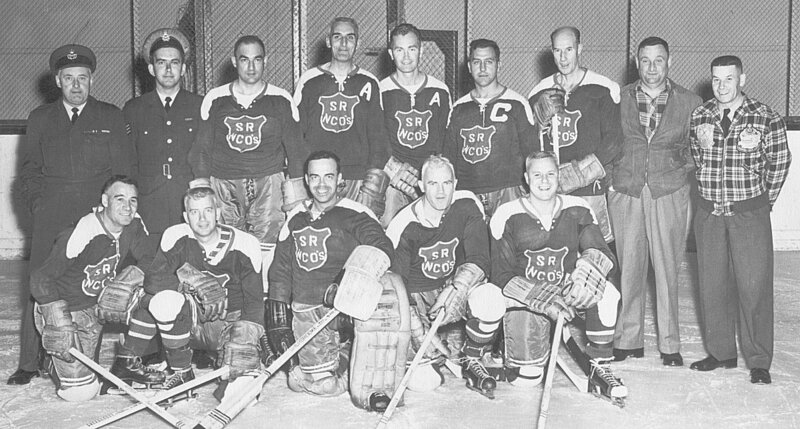 Can you match any of these names to the faces: Scotty Vente, LR Whtyte, Ray Sprague, George Bourlet, Sten Walter, Bob Clark, Dave Schmidt, Lloyd Hanna, Maxie MacMaher, OS Coates, Norm Dixon, J Mellish, Joe Helloy, Pete Bilech, Dany Danylcluk. 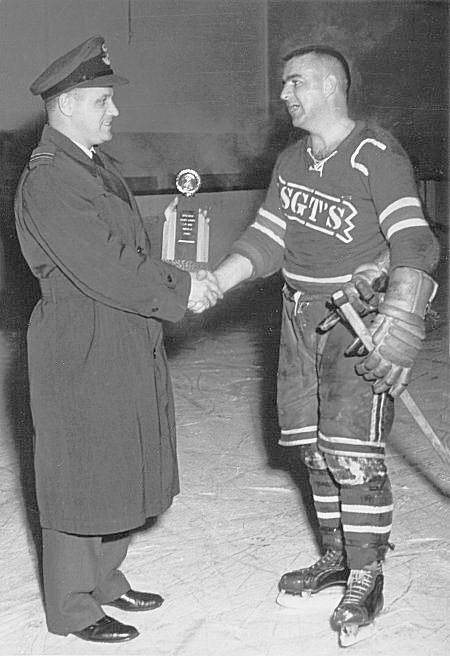 Moxie MacMahn receiving the Station League trophy - March 1959. 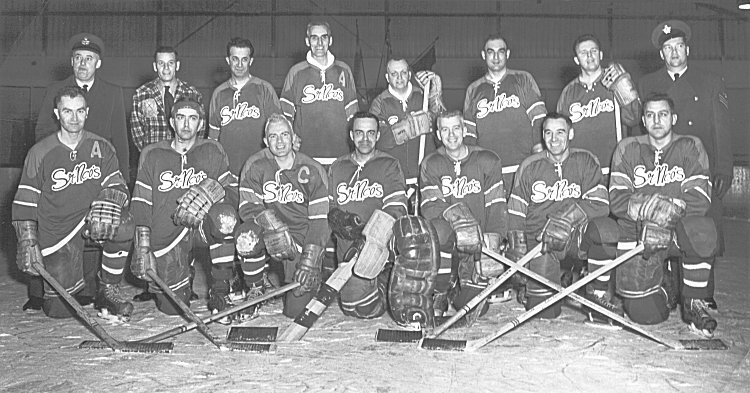 The first "Mechs" hockey team - March 1959. 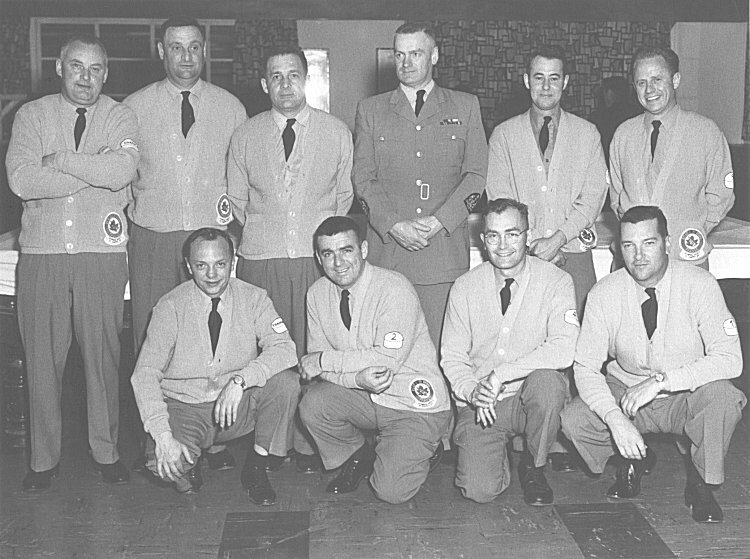 Back row (L-R) Beau Staples, Charlie?, Bruce Glover, Bill Backwood (SWO), Lloyd Hanna, Stan Wallace. Front row (L-R) J Mellish, Moxie MacMahn, Pete Bileski, Norm Dixon. 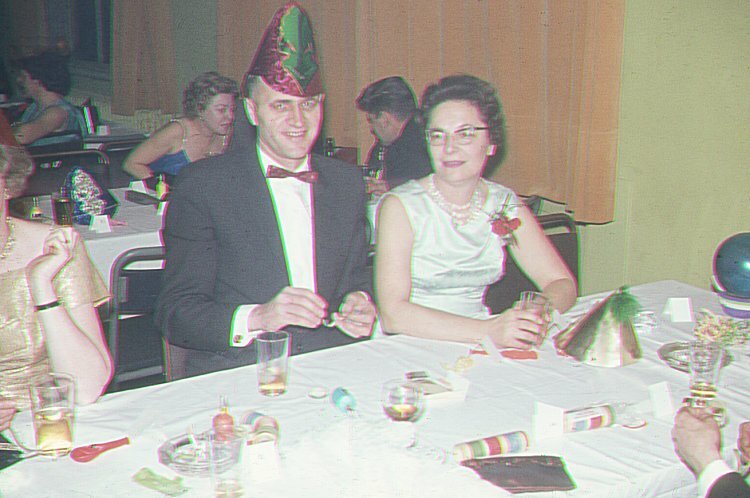 Assorted photos taken during a promotion party - October 1957. 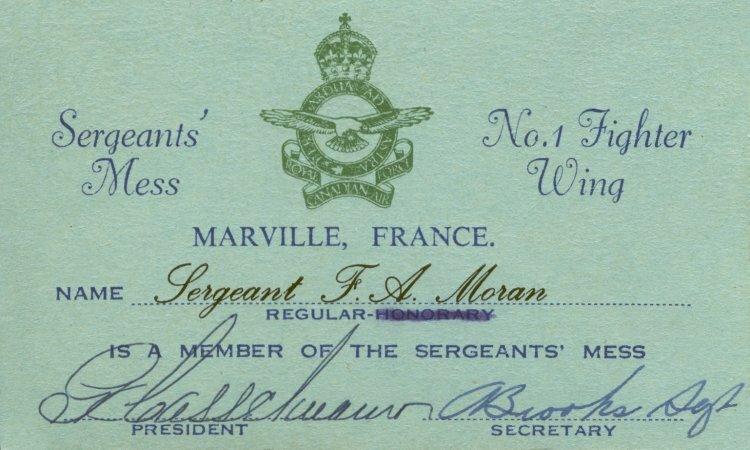 Membership card to the Sergeant's Mess - June 1955. 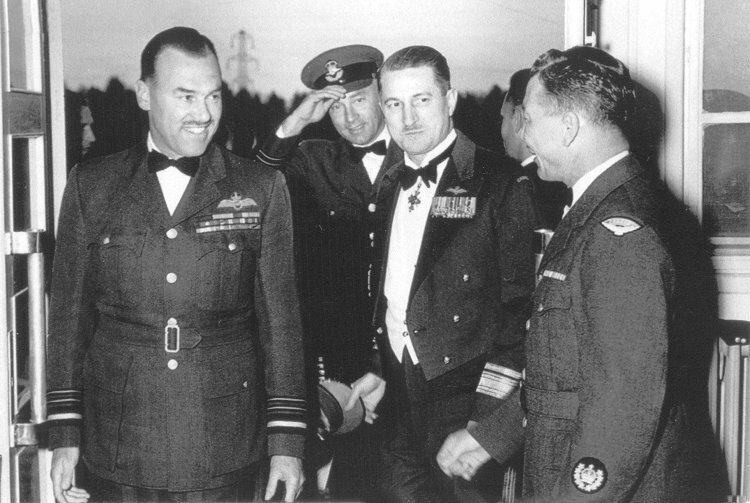 A/M Slemon at official opening of the Sgts Mess - 5 May 1955. Courtesy National Archives of Canada C207970. 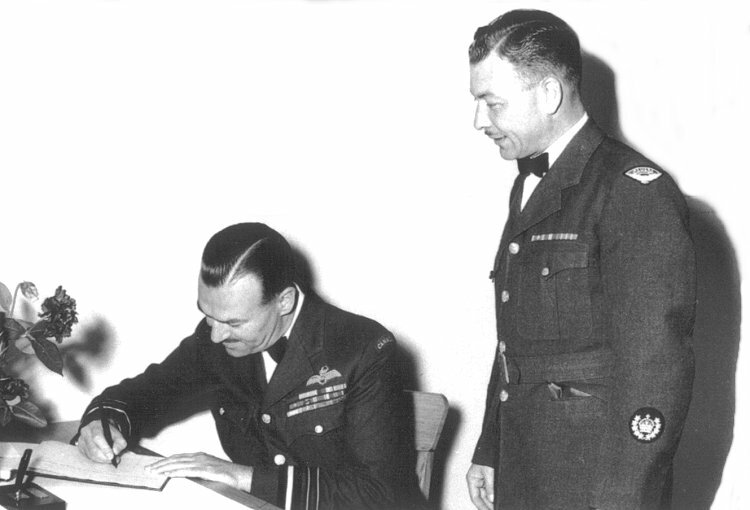 A/M Slemon signs the Guest Book in the Sgts Mess - 5 May 1955. Courtesy National Archives of Canada C207969. Members of the Sgts Mess at the official opening - 5 May 1955. 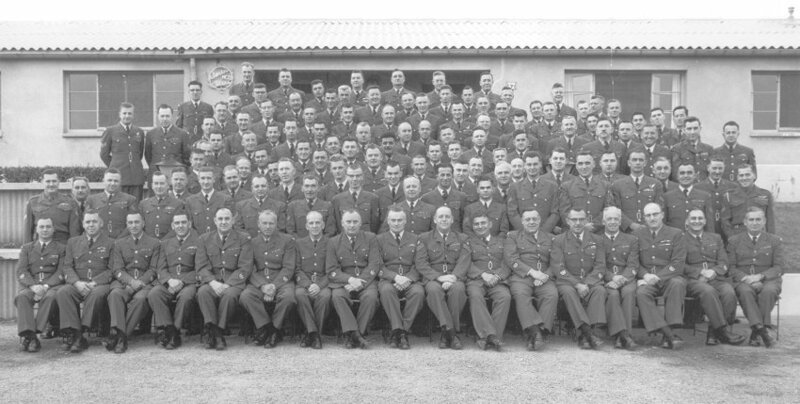 Larger image of the members of the Sgts Mess photo - 5 May 1955.